I love leaving comments on other people's posts anyway but something that I have noticed is that PR's do read the comments and on a couple of occasions now the PR has then contacted me to ask if I'd like to review a product. On this occasion I commented on a post about the Dermalogica Hydrablur primer saying I'd really like to try the Redness Relief* primer. I was then contacted by Dermalogica asking if they could send me the primer to try. The Dermalogica Redness Relief primer* comes in a long thin tube with a screw off lid and when I first tipped this out of the cardboard packaging I was confused by a little bit of plastic that fell out with it. After staring at it for a few seconds I realised it's one of those tools for pushing all of the product out of a tube. What a fab idea and I'm hoping it's large enough for me to be able to use with other products once I've got through this. The tube has a small, precise nozzle for dispensing the product, although you do have to be careful if you're pushing up from the bottom of the tube as you can suddenly end up with a green worm of product appearing. The best way to try and describe the colour and consistency of this product would be to compare it to wasabi, it looks just like it! If you're not a fan of sushi you might not have comes across this but it's basically a green paste that can blow your head off a little if you're not careful as it tastes like horseradish. You mix wasabi with soy sauce and then dip your sushi in it. 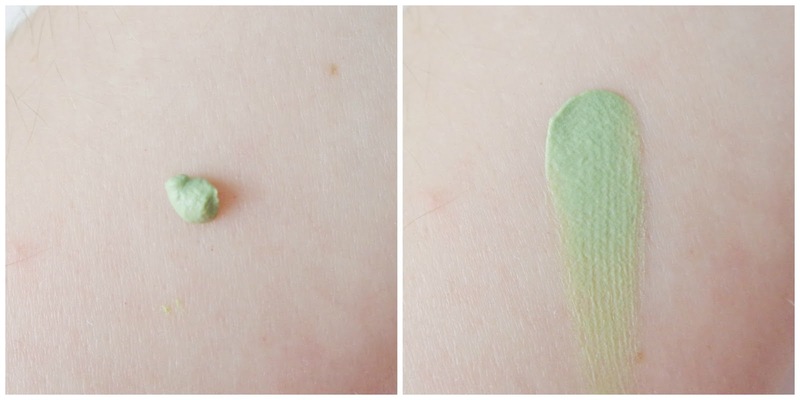 The primer comes out quite thick, but as soon as your start applying it the paste melts down and spreads easily. When I first received this I didn't realise it was a silicone based primer. I've never been a fan of silicone primers, that's why I'm not a fan of Porefessional, however I do like this one. I find Porefessional difficult to apply as it just seems to disappear into my skin straight away so I can't spread it very far, but the Redness Relief primer isn't like that at all. Silicone primers are probably not the best thing to use on dry skin as they can be drying, but this does contain oat extracts and oat kernel oil to help soothe and condition the skin and I haven't noticed my skin drying out while using this. When I first apply this it doesn't appear to make a huge difference to my redness, although it definitely helps to balance things out a little, but when I do see the difference is when I then apply my foundation over the top. It also provides an amazing base for my foundation making it glide on very smoothly. Once I have this and my base on I don't have to use as much concealer over my red bits. While it doesn't appear to make a drastic difference to my redness it does help improve it and in general is a very nice primer to use under make-up. Another bonus for me is that it contains SPF of 20, so unless I'm going to be spending a long period of time outside, when I would then use a separate higher SPF, I know my face is protected without me having to apply a separate product. The Dermalogical Redness Relief primer is £38.40 and is available from the Dermalogica website. Are you a fan of any Dermalogica products? I have enjoyed using Dermalogica skincare in the past, but didn't know they also did makeup/base products until now! I will have a look at what else they offer after I've sent this comment! I've never tried any Dermalogica products, but I keep hearing good things about their line! This primer looks nice, and I'm glad it does make somewhat of a difference and isn't gimmicky. I've heard good things about this dermalogica product! Going on my wish ♥ list now.